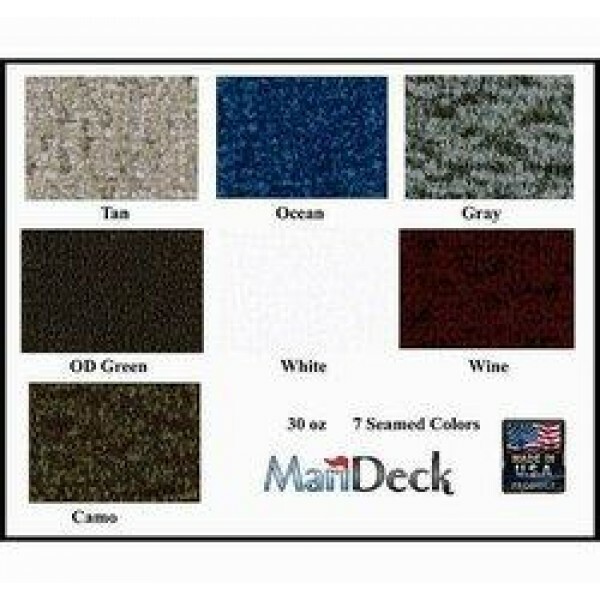 The MariDeck product is the attractive, durable, time-tested vinyl alternative to traditional high maintenance marine carpet. It looks great on your boat and will stay great looking while protecting your investment against the potential rigors of difficult environmental conditions. Cleaning up after a successful fish or hunt is a snap with just a spray of water. In the past, your boat carpet didn't stand a chance staying clean with kids, pets or messy meals. Thankfully, those days are long gone with MariDeck on your boat floor. 72" width is ideal for aluminum fishing boats. • Easy to install for the Do-It-Yourselfer! Tan, Ocean, Gray, Camo, White, OD Green, wine. *Before Cleaning your Marideck vinyl flooring please be sure to use a proper vinyl flooring cleaner. Certain chemicals can have a chemical interaction with our PVC vinyl flooring. The following ingredients are not compatible with our vinyl boat flooring.